Nisbets.ie Vouchers, Discount offers and Free Gifts in April 2019. Redeem a Nisbets.ie Voucher from voucher-code.ie and get your benefit at nisbets.ie. Never miss again a Nisbets.ie voucher or sale offer! Nisbets offers catering equipment and refrigeration to the trade. Nisbets also offer an extensive consumer range of kitchen essentials such as utensils, crockery, glassware, and kitchenaid mixers to name a few. Nisbets ireland has 21,000 products available and free next day delivery on orders over €80 (exc. VAT) placed before 5.00pm. Nisbets full catalogue range and more can be browsed and purchased securely online at nisbets.ie, with a range of delivery options to suit all requirements. Stock can be checked in real time, and orders tracked to delivery via ‘My Account’. Customer satisfaction is integral to their business, and to this end they offer a free 30 day ‘no quibble’ money back guarantee on all purchases. 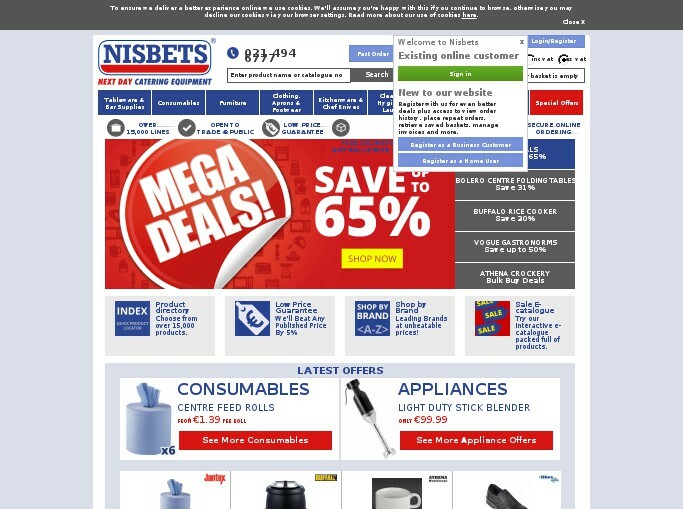 Money Off Discount E-Vouchers can only be redeemed online at www.nisbets.ie. Money Off Discount E-Vouchers are single-use only. Multiple Money Off Discount E-Vouchers cannot be used in the same transaction. The full face value must be used in the same transaction. No change or credit will be given for any unused balance. Money Off Discount E-Vouchers cannot be exchanged for cash. Money Off Discount E-Vouchers can be redeemed as full or part payment for goods. For part payment you will need to pay the balance of your order with an alternative payment method in the same transactions. Nisbets Plc standard terms & conditions of sale will apply to all goods that are purchased with a Percentage Discount E-Voucher. 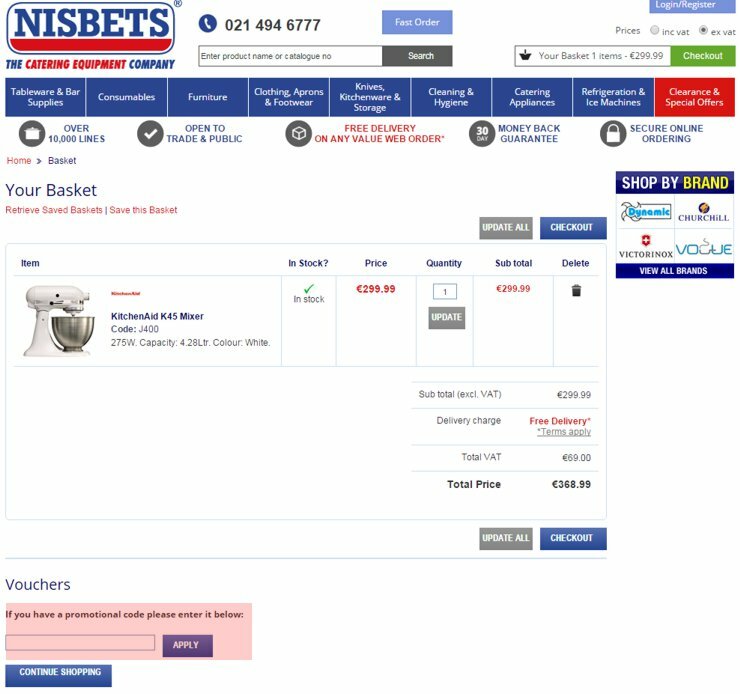 Please enter a Nisbets ireland voucher code directly in the 'Vouchers' box on the basket page and activate encashment by hitting the "APPLY" Button. Discounts will be applied only if the code is valid and meets the minimum value required. Free standard delivery at nisbets.ie. No code needed, discount applied on site.